It’s an ad the majority of readers out there can easily conjure up in their heads. A cartoon of a skinny, 97-pound weakling who gets sand kicked in his face by a beefcake, uses the moment as inspiration to build his body, and comes back to the beach to give the bully his belated comeuppance. 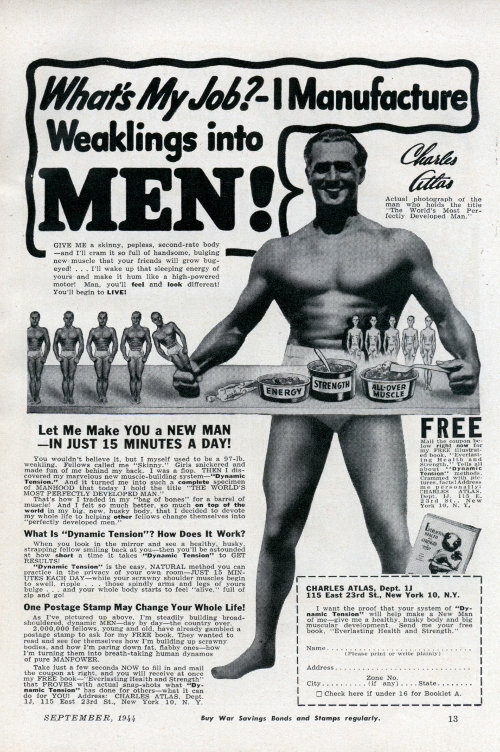 The name associated with that image is just as familiar as the ad itself: Charles Atlas. That these two images go hand-in-hand may have led you to see Atlas the man as a cartoonish caricature, or to view him in the light of the thousands of sometimes shady modern-day fitness hucksters who have taken Atlas’ old mail-order business model and ramped it up for the online age. But Atlas was that true rarity, a man equal to the marketing hype—the real deal. 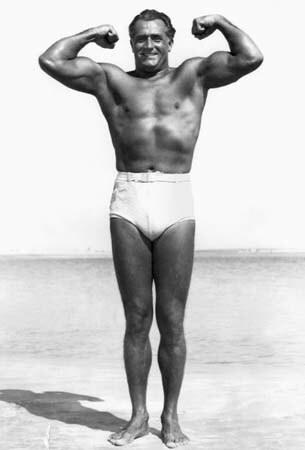 He was a scrawny immigrant kid who transformed his body and launched a fitness revolution by creating a 12-lesson exercise course that was translated into seven languages and adopted by millions around the world, including King George VI, Joe DiMaggio, and Rocky Marciano. Even Mahatma Gandhi wrote to inquire about the program—no kidding! 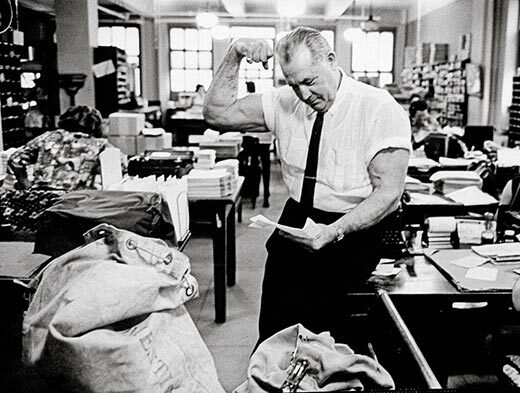 The mail-order business Atlas started has now been around for 82 years (although it’s currently run by others—Atlas died in 1972), and thousands continue to look to his program for a way to get in shape. 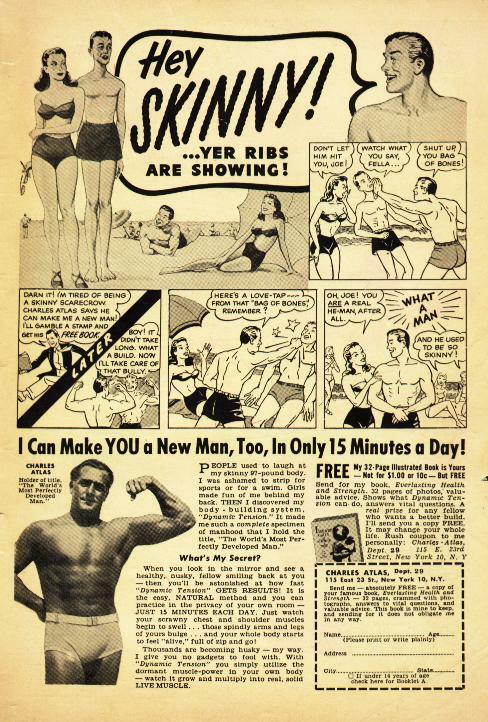 For the men who lost confidence in themselves during the Great Depression, Charles Atlas was a source of hope and inspiration. 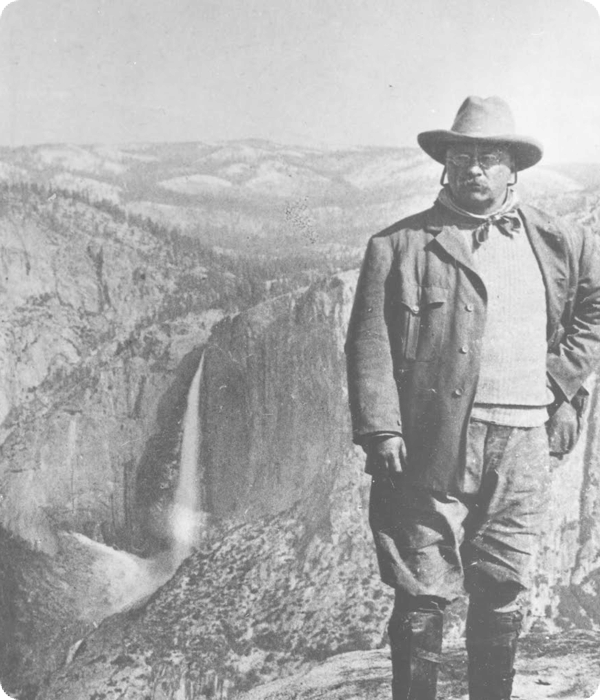 Today he remains a symbol of virile strength and vitality, and his life offers us several lessons in manliness. But the pummelings continued. At age 15, Atlas really was a “97-pound weakling,” and said he really did get sand kicked in his face by a beefy lifeguard in front of a good-looking gal. From an auspicious start, Atlas built his body into a man’s whose measurements would be buried as part of the Crypt of Civilization at Oglethorpe University, which won’t be opened until 8113. He turned his most hated-weakness into his most famous strength. How did Atlas go from a scrawny kid to what one scientist called, “the absolute masculine ideal?” From inspiration he received at a museum and a zoo, respectively. While on a school field trip to the Brooklyn Museum, Atlas gazed with wonder at the statues of Greek gods, focusing particularly on the muscular physique of Hercules. He asked his teacher how he could build a similar body, and he suggested that the young man try lifting weights. So Atlas began a diligent exercise program. He couldn’t afford to buy weights, so he jury-rigged some together at home and used them every morning. But after months of training, he wasn’t at all satisfied with the results—his body was still lean and lanky. Young Atlas wondered how to proceed. 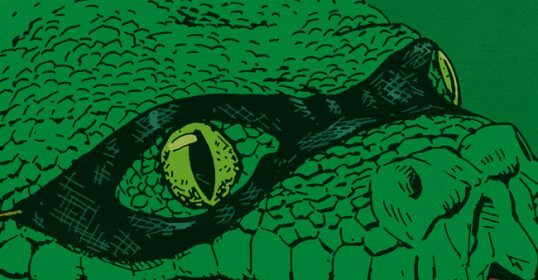 The answer came as he was walking through the Bronx Zoo—a place he would often go to think. As he stopped to admire the lion exhibit, he saw that jungle beast stretch, and observed the way in which its “muscles ran around like rabbits under a rug.” That’s when his light bulb went off: The lion was strong but had never used a barbell or any exercise equipment. “He’s been pitting one muscle against each other!” Atlas thought. Atlas went home, deciding to try something different—“working out” like the lion did. He discarded his weights and developed a new exercise program for himself—this one based on isometric exercises. Pushing one arm against the other, push-ups, sit-ups, squats, leg lifts, and so on. Atlas’ business partner, Charles Roman, said that Atlas continued to observe animals his whole life, always on the lookout for a bit of inspiration on how he might improve his fitness regimen. Carve out your own path. Many men these days are constantly looking to other people to give them a plan for every aspect of their lives, but sometimes the best plan is the one you create yourself! In the early 20th century, the use of weights and barbells was just catching on, and bodybuilding was a fringe movement—strongmen were curiosities who performed at carnival sideshows. 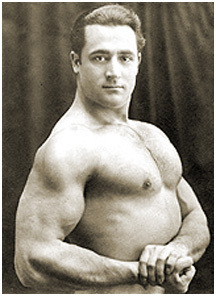 That’s where Atlas saw the most famous of the oldtime strongmen—Eugen Sandow. Atlas used Sandow as inspiration and tried lifting weights like his hero. He also experimented with pulleys, calisthenics, and other exercise programs that were popular at the time. When these methods did not yield the results he was looking for, Atlas stopped trying the established regimens, and created one of his own. 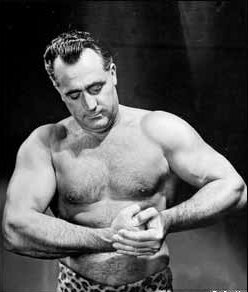 While isometric exercises had been around for thousands of years as part of disciplines like yoga, and were popular among professional strongmen, it was a relatively unknown approach to most Americans. Atlas self-reliantly experimented with and put together his own exercise routine. And he was able to put these time-honored exercises into a program that could be followed by the average joe. He came up with a way to make fitness truly accessible—his course was so popular because it required no equipment whatsoever and could be performed by anyone in their own home. Atlas went against the grain, and in so doing, not only found success himself, but launched a whole cultural movement. Always seize an opportunity…especially when it’s to work for yourself. Having a skill or talent doesn’t automatically translate into success. After building up his body, Atlas’ life didn’t immediately change. He continued to work as a leatherworker, before quitting to take a job as a janitor and a sideshow strongman at Coney Island. He would lie on a bed of nails while an audience member stood on his stomach, rip telephone books in half, and bend iron bars into U’s. But these kinds of stunts were common on the strongman circuit, and Atlas might have labored in obscurity forever had he not been noticed by an artist in 1916. The commissioning of public statues was on the upswing, but artists were having trouble finding worthy models to pose for their sculptures. When the artist spied Atlas one day on the beach, he asked him to come back to the studio to pose for him. Atlas was unsure about doing it, but decided to see how the opportunity played out. Other artists heard about the man with the incredibly well-proportioned body, and soon Atlas was in great demand, running from one studio to another, and collecting $100 a week. 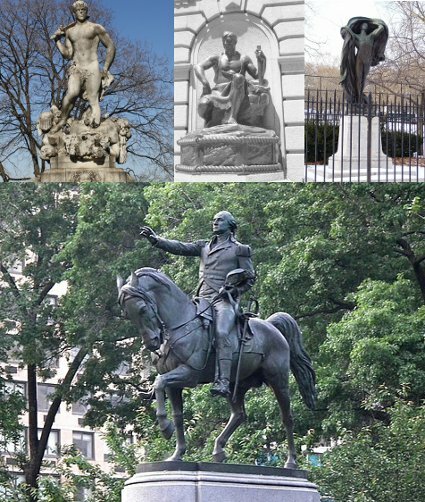 Charles Atlas was the model for 75 statues that can be seen all around the country. But modeling did not satisfy Atlas’ great restlessness and ambition. In 1921, he submitted a picture to the “World’s Most Beautiful Man,” photo contest which was sponsored by the founder of Physical Culture Magazine, Bernarr MacFadden, and he easily won the $1,000 prize. 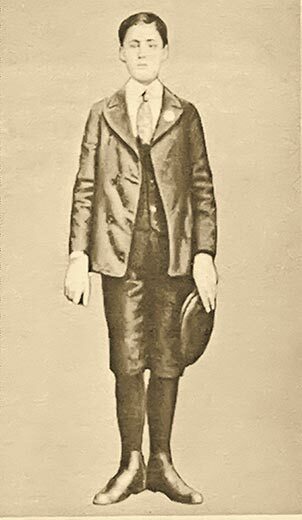 A year later, he won MacFadden’s “World’s Most Developed Man” contest, beating out 775 men in a showdown staged publicly at Madison Square Garden. This time, the prize was either $1,000 or a screen test for the starring role in a new Tarzan film. Atlas took the money. He didn’t want his future to be at the mercy of Hollywood execs; he wanted to start own business and be in charge of his own destiny. A wise choice…after all, who remembers the name of the actor who starred in The Adventures of Tarzan? Be humble enough to admit when you’re in over your head. 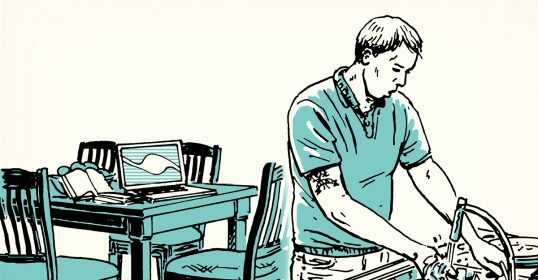 Atlas invested his $1,000 in selling his fitness course by mail. In the first two years of business, several thousand orders were placed, allowing Atlas to open his own gym in New York City. But in trying to run the two businesses at once, both of them floundered. Atlas realized he needed to focus on just one thing—promoting his exercise course—and that he couldn’t do it alone. In 1928, his advertising agency hired 21-year-old Charles Roman to help create better ad copy. Roman came up with the idea of giving Atlas’ isometric exercises a snappier name–“Dynamic-Tension”—and formulated the now-famous 97-lb weakling ads and their memorable headlines. Atlas could see that Roman was a marketing genius, and he offered him half of his company, on the condition that Roman run it. The ad man agreed, and the rest is history. Roman created irresistible ad copy and booked Atlas promotional gigs; Atlas showed up with his muscles and charisma. The two were a match made in heaven. An enormous part of the appeal of Charles Atlas was that he didn’t just sell his principles, he lived them. “Live clean, think clean, and don’t go to burlesque shows,” Atlas was fond of saying. Living the clean life meant not only exercising regularly, but keeping your room tidy, getting fresh air, eating healthy food, and avoiding tobacco and alcohol. Atlas himself didn’t smoke or drink, and on the rare occasion someone convinced him to come out to a nightclub, he’d spend the evening sipping a glass of milk and trying to convince other patrons to swap their beer for orange juice. Unsurprisingly, he held New Year’s Eve celebrations that provided carrot juice instead of champagne. He was also a tireless promoter of the Boy Scouts. And despite becoming a multi-millionaire, Atlas lived modestly; only splurging when it came to his beloved white double-breasted suits. Atlas’ life was remarkably scandal-free, and his only brush with controversy, far from injuring his reputation, actually improved it. Bob Hoffman, who owned the York Barbell Company, sued Atlas, claiming that you couldn’t get an Atlas-like physique with just isometric exercises (which he called “Dynamic-Hooey”) or see a change in your body after just 7 days, and that Atlas was a fake. But the resulting Federal Trade Commission investigation found no evidence of false advertising or unfair trading practices, forcing Hoffman to drop his attacks. Atlas was also incredibly devoted to his family and his wife. When she passed away in 1965 after their 47 years of marriage together, Atlas’ grief and depression were so profound he considered joining a monastery. But his parish priest convinced him to reconsider, telling Atlas his life’s mission lied not in the cloisters but in continuing to inspire young people. The Father was not flattering the strongman. 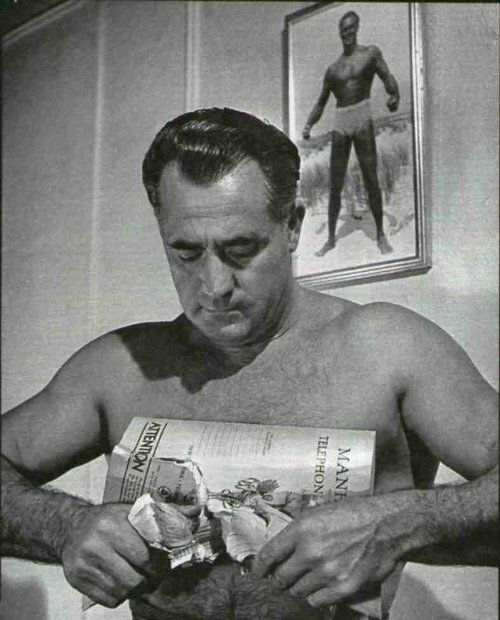 At the peak of his popularity in the 30s and 40s, Atlas received so much fan mail that he required a team of nearly 30 women to open and sort it. The letters, often written by young men, came from all over the world and expressed sincere appreciation to Atlas for changing their lives. Despite how large his company got and up until his 60s, Atlas always went into his office in the afternoons to answer some of the letters personally, and sign all of the replies himself. He would also sit and talk with fans who came by looking for advice. 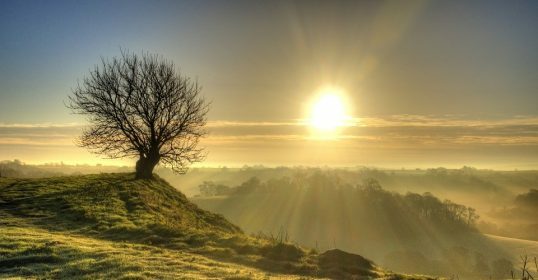 As he grew older, be refused to let himself go, because he knew young people looked up to him, and he didn’t want to be a hypocrite and a bad example. So he kept up his morning exercise routine—50 knee bends, 100 sit-ups, and 300 push-ups–and at age 75, his measurements were almost identical to his measurements at age 30. He spent the last two years of his life reading his Bible and running on the beach, and died at age 79 in 1972.